Lock in a great price for The Sunnyside – rated 9 by recent guests! Great location, clean, close and quick walk to the pier and restaurants. Delicious breakfast. Met some really nice people who were also staying there. The property is in an excellent location in town. The breakfast was wonderful (the breakfast link sausage is supreme) and the service was attentive and kind. Jordan, who works the desk, gave us so many helpful hints and suggestions. He truly cares about his guests and is an all around nice man. They room was terrific and the linens and towels were fresh. I would stay here again in a heartbeat! New owners have recently taken over they made us feel very welcome and provided knowledge of Llandudno which was very helpful. Breakfast was lovely and good value for money all round. Will definitely go back. Excellent hotel, staff were more than accommodating, food was delicious. Highly recommend to all. Staff was very friendly. Great location, 20 min ride to Conwy. Breakfast was good, typical English. Staff was friendly and helpful - room was very comfortable and centrally located near restaurants, shops and pubs (few minutes walk). Great location. easy access to restaurants, shops, pier and beach; spacious room. The Sunnyside This rating is a reflection of how the property compares to the industry standard when it comes to price, facilities and services available. It's based on a self-evaluation by the property. Use this rating to help choose your stay! 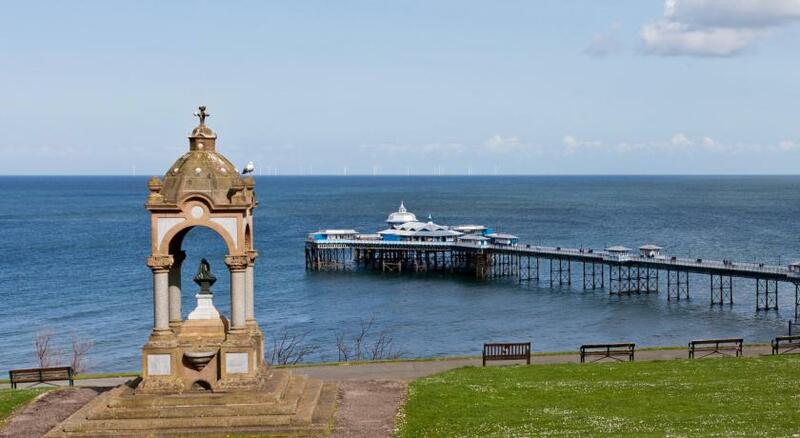 One of our top picks in Llandudno.Located in the Victorian resort of Llandudno, The Sunnyside is just a few minutes' walk from the promenade and near the Great Orme. The family-run establishment is within 2 impressive Victorian houses, central to the town's shops and restaurants. Set over 2 floors, each individually decorated room offers an private bathroom, a TV, and tea and coffee making facilities. The Sunnyside has a welcoming lounge with a TV, where guests can enjoy evening drinks from the small bar in reception. Located just 5 minutes' walk from Llandudno Pier, The Sunnyside is a 10-minute stroll from the Llandudno Ski Center and West Shore. When would you like to stay at The Sunnyside? This first-floor room features a flat-screen TV, tea and coffee making facilities, and an en-suite shower room. There is no space for extra beds or cots. This room can accommodate a maximum of 1 adult. The rooms feature a flat-screen TV, tea and coffee making facilities, and an private bathroom. There is no space for extra beds or cots. Most rooms are located on the second floor and have a sloped ceiling. Rooms feature a flat-screen TV, tea and coffee making facilities, and an private bathroom. This room can accommodate either 2 adults or 1 adult and 1 child. Extra beds and cots cannot be accommodated in this room type. This room features a flat-screen TV, tea and coffee making facilities, and an private bathroom. Located on the second floor, the room has a sloped ceiling, 2 single beds, and 1 double bed. This room type sleeps either 2 adults and 2 children, or 3 adults. This deluxe room has a king-size bed in the main bedroom and an adjoining room with a day bed suitable for 1 adult or 1 child. This family room for 2 adults and 2 children has a king-size bed in the main bedroom and 3-foot bunk beds for children under 10 years in the adjoining room. This large double has either a king-size or super king-size bed and will accommodate a child in either a folding bed or travel cot. This room will accommodate 2 adults, or 2 adults and an infant in a travel cot. Located on the first floor, this room has a double bed, en-suite shower room, TV and tea/coffee making facilities. This room type is the smallest of the property's double rooms and will accommodate a maximum of 2 adults, or 1 adult and 1 child. There is no room for extra beds or a travel cot. House Rules The Sunnyside takes special requests – add in the next step! The Sunnyside accepts these cards and reserves the right to temporarily hold an amount prior to arrival. Groups and parties can be accommodated on request, subject to availability. Please inform the hotel if check-in is going to be later than 21.00. Please note it is not possible to check in after 23:00. This property does not have parking on-site, but there is free on-street parking available nearby. Reservation is not possible. Hard to find parking space close to the hotel. Parking, but to be fair Llandudno on a bank holiday Friday. Managed to get in at the church so left it there overnight. Very friendly hosts, very clean and a great breakfast. Our room was brilliant a real home from home and a great location for our favourite pub "The Kings Head". The hotel was set back from the main strip but it was still extremely noisy. Due to the property being more of a guest house, it was very noisy when people were coming in at night, using the bathroom and taking showers. The hotel was well presented & staff was lovely and pleasant. The breakfast was really nice and service was efficient. Beautiful water pressure in the shower but it made an unfortunate screaming noise. Chocolates left on our beds, plenty of milk provided with tea/coffee making facilities. Shower gave perfect temperature and water pressure. Brilliant location, a stone's throw from pubs/cafes and North Shore beach. Clean ,friendly staff, relaxed atmosphere. Close to the beach and shops. having to go up six flights of stairs with my wife having breaving problems did not help.also we went out one day to come back and the cleaner had left our room open.luckily nothing went missing. the meals were okay for the 2 days we were there. A very friendly welcome .Our room which was ready ahead of schedule was very clean ,comfortable and quiet. Our breakfasts were well cooked and presented using excellent tasty local produce . Staff were great. I got a late breakfast as I had a run that morning and didn’t want to eat til after it. All very helpful. We were surprised with the size and comfort of the family room which was very comfortable for 4 people.